Marika Blossfeldt is the author of Essential Nourishment. 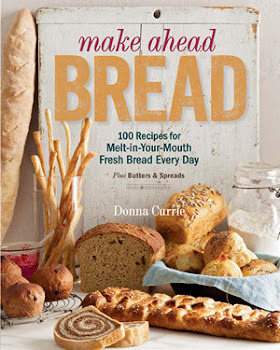 Not only is she sharing her insights about the book - AND a recipe - but there's also a giveaway of three copies the book! Q. What prompted you to write your first cookbook? A. In 1995 I was very lucky to find a dilapidated, yet beautiful old farm called Polli Talu (meaning Polli’s farm) in my native country Estonia. It had always been my dream to live in the countryside, and buying this farm was a first step to living my dream. Now, what would a dancer, choreographer, now yoga teacher do in the countryside? Well, I envisioned restoring the farm and transforming it into an international center for the visual, performing and healing arts. That took several summers of hard work – but in 1999 we opened the doors to the dance studio and began with our first events: a Reiki seminar, a yoga intensive and our first guest artist arrived to take up residency. With the years we added an art studio, housed in the former stable and a writer’s studio, housed in the sauna building. 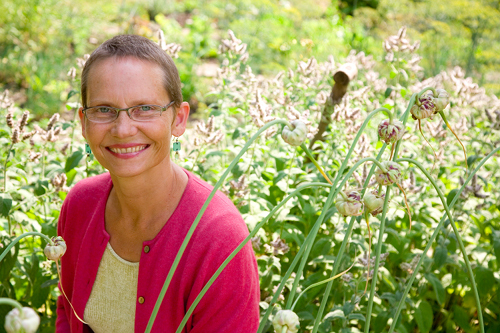 Now approaching its 15th season, summers are packed with inspiring workshops, rejuvenating retreats and lovely guests. Being in a rural area of Estonia, I was faced with the necessity of feeding my guests. First I simply followed my gut feeling (no pun intended), which is not such a bad thing at all, as it turns out with scientific research to back it: we actually have a second brain in the belly. Intuitively I felt inspired to feed my guests simple wholesome meals made from natural ingredients. I remember thinking, if I make porridge for breakfast – at least they will get one serving of whole grains per day. And that seemed reassuring at the time. And, by the way, it is still our traditional breakfast fare at the farm. Our guests really enjoyed the food I made and frequently asked me: so when are you going to write a cookbook? I put it off for many years, as I thought: surely this means a lot of work and will be very costly on top of it – which, as a self-published author now speaking from experience, really is true. Comes 2004 and I decide that maybe it’s time to get some nutritional education, so that I’d be equipped to feed my guests balanced and nutrient-dense delicious meals. In my winter home, then NYC, a catalogue from the Institute for Integrative Nutrition arrives in my mailbox; I take one look and know, this is the school I want to go to. Fast forward to 2007 - I have since graduated and become a health coach – back at the farm I am sitting around the dining table with the women in my week-long Passion, Purpose and Pleasure Wellness Retreat and the question comes up again: so when will you write your cookbook? My niece Ave is one of the participants and she looks at me and says: let’s do it and I look at her and say – OK – let’s do it! And thus she became the producer for the book and I the writer and artistic director. Q What kind of a cookbook is it? 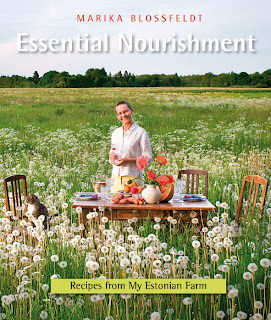 A Essential Nourishment is a beautifully designed cookbook and nutrition guide fusing an appreciation for the sensual pleasures of natural food with a common-sense approach to nourishment. Each whole food recipe is easy to recreate and accompanied by a sensuous full-page photograph - taken at Polli's farm, an exquisitely serene environment. What I am trying to do, is seduce my readers to eat healthy. Potentially life changing, Essential Nourishment is an inspiring, concise and very practical holistic lifestyle companion, weaving together food, art and the joy of living a healthy and fulfilling life with gentle, easy to implement suggestions for balanced eating, abundant energy and genuine well-being. By following my gentle guidelines, you will notice your body humming with joy and good vibrations. Q Would you like to share a story from the making of your book? A I love telling the story behind the cover image for the book. You know how sometimes (really most times) you have a very clear vision of what you would like something to look like and when you get around to making it, be it a painting or a photo, it looks so different from the image in your head? Not so with the cover shot. From the time when I first started working on my farm, I remember taking out the old dining table and kitchen chairs to be able to enjoy a meal outside in the summer time – one of my favorite things to do – especially since I grew up in an apartment building without a garden. Everything tastes so much better in fresh air! It struck me how different a real table with chairs looked in the grass as opposed to the look of garden furniture. Something about that I just totally loved. So when the time came to conjure up an enchanting cover shot, I remembered that image and envisioned a table setting in the middle of a wild meadow with tall grasses and dandelions. The table was set for a small dinner party with wine glasses and a vase filled with flowers. Since my book is all about natural foods, as close to Mother Nature as possible, I wanted to arrange whole uncooked foods on the table. I imagined myself standing behind the table ready to greet my guests. I wanted the horizon to be above my head, so that I would be totally immersed in the green meadow. We found the perfect spot; we knew that the light would be best in the evening, when the sun would be golden and shining from just the right direction. We set everything up – careful not to disturb the dandelions that where past bloom and had turned into fluffy white balls of delicate tiny seed parachutes. Then I came on the stage. What I did not expect where the thousands of mosquitoes that immediately attacked me. It was so bad that I could not think straight anymore. I did my best to look relaxed and happy, but truly, it was torture. I couldn’t wait for the shoot to be over, hoping that there would be at least one photo where my face doesn’t look like I am going mad. And then the amazing thing happened. Out of the blue my cat came and decided to join us in the meadow. She went for the chair on the left, hopped on it and sat, dreamily looking into the distance. We took one more shot and that was the perfect picture. When I looked at it later on the computer screen I couldn’t believe my eyes. The photo was exactly how I had imagined, the feeling, the light, the composition and the icing on the cake was my beautiful kitty, perfectly poised, sweet and serene. Q Would you like to share a recipe from your book? A I would love to. There is one recipe that has become my signature recipe. 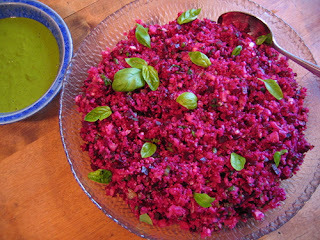 It is a quinoa beet salad, easy to make, refreshingly delicious, looks gorgeous thanks to the intense color of the beets and can be enjoyed by vegans and gluten and lactose intolerant persons as well. Place the whole, unpeeled beets into a pot, add water to cover and boil until soft, about 40 to 60 minutes. In a separate pot, bring the 2 cups (480 ml) of water to a boil and add the quinoa and salt. Bring to a second boil, then reduce the heat to its lowest setting and simmer, covered and untouched, for 15 minutes or until all the water is absorbed. Spread the cooked quinoa on a large plate to cool. When the beets are soft, douse them in cold water until cool, then peel and cut them into small cubes. Combine the cooked quinoa and beets in a bowl and add the fennel, scallions and chopped basil. Combine the dressing ingredients in a glass jar. There should be about twice as much lemon juice as oil. Close the lid and shake to mix. Pour the dressing over the salad and mix well. Let the salad marinate for at least ½ hour. Just before serving, toss gently and adjust lemon juice and seasoning if necessary. Garnish with basil leaves and serve with a green salad. Three lucky participants will win a copy of ESSENTIAL NOURISHMENT. We’ll mail your book for free to anywhere in the world. Share it on your wall. Want to know more about the book? Check out the book trailer on YouTube.